This past weekend I spent many hours at the ballpark. This was the view right next door. 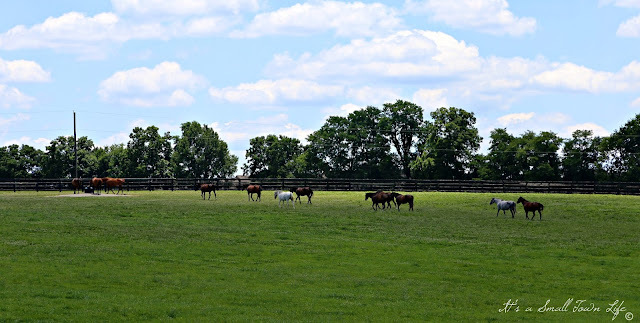 I might explain that it was in Lexington, Kentucky, also known as, "The Horse Capital of the World". These views were right outside the ballpark. The entire city is gorgeous, with horse farms at every turn. Our two days of games did not yield a tournament victory for the girls, nor did I have time to visit my favorite bookstore, but the team came together and played better than they have recently. Getting their confidence back after a recent slump is the real victory. Hello, love the pretty sky and the horses. Kudos to the girls! Happy Tuesday, have a great day! ...a lot of horsing around down there! It's not winning but how you play the game that's important! I'm not sure how really competitive people feel about that expression 😀 You were surrounded by very beautiful countryside Michelle.. congratulations to the team! had a great time making memories. ooooh how convient!! pictures of these beautiful landscapes and a game to watch. now here's the big question, what did you watch more??!! I'm jealous of such beauty and tranquility!!! Wow. Extraordinary images Michelle. By the way, your header? The calf [or is it full grown cow?} peaking through the iron gate/fence is a hoot! Made me giggle. Love the views, very pretty scenery. Glad to hear the slump has left the field. Onward to better times and more fun for the team. This looked like such a beautiful area! Those rolling expanse of dark green grass looks so pastoral. We have not had rain in a long while and our hills are turning brown again. Finding misplace confidence s fun to watch...as are these views! Wow! The scenery is beautiful! Playing well and having a good time is the best! That's winning in my book. Yeah, I think I'd be watching the horses too. We lived in Mt. Sterling, KY which is 30 miles from Lexington for 11 years. 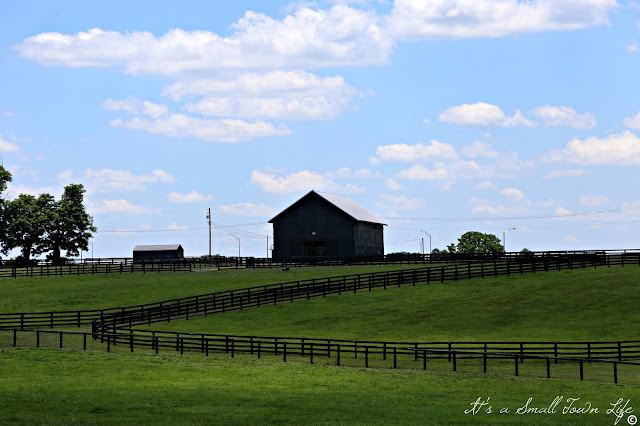 Love those rolling hills, horse fences and KY bluegrass! Ah, the baseball tournaments! How you brought me back to those days! Sorry they didn't win, but I'm glad they were able to pull together as a team. Those slumps are hard going. Yea for the team! But I'm really sorry you didn't have time for that bookstore. Love that last beautiful photo! Horse country is gorgeous. Beautiful country! And sounds like the weekend was a success for the girls, too, if it helped them get their groove back. beautiful views...it would be difficult for me to focus on the game! glad to hear the girls got their confidence back! i hate when the team feels beat up. sorry about not being able to visit your bookstore...it looks like a nice one! That's the words to describe the picture in this post. Beautiful country . . .
A win feels wonderful but playing a good game, without winning, feels good too . . . 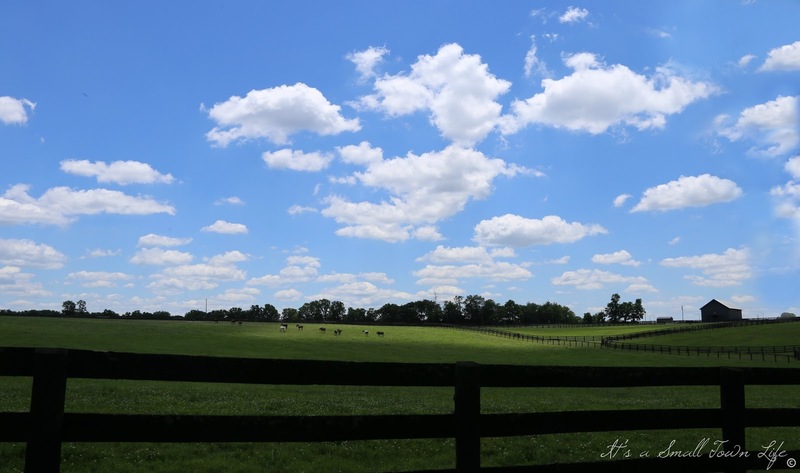 Yes, Lexington is indeed gorgeous. There is a reason they call it bluegrass country.